Featured by Enterprisers Project - a joint initiative of Harvard Business Review, CIO Magazine and RedHat. Continuous Delivery is often described from the perspective of the technicians. This is understandable, because that is where it started, but it does the process a disservice. Continuous Delivery is a holistic approach. It requires change across the organisation and it encourages such change, to the betterment of the groups that practice it. This book addresses that problem and looks at CD from an organisational perspective. It starts from Dan Pink’s ideas of intrinsic and extrinsic motivators and describes how to structure an organisation for success. How to encourage a focus on Autonomy, Mastery and Purpose that will motivate your teams and produce high-quality results. This book takes a look at all aspects of organisational design that impact on its ability to deliver regular, small, high-quality changes. If you follow the advice in this book, your organisation will be the better for it. Agile IT Organization Design tackles all the problems that we just want to ignore. Relying heavily on hands-on experience, rather than theoretical exercises, Sriram provides concrete actions that address the issues with Agile software development and continuous delivery at a structural and organizational level. He addresses issues of finance, accountability, and metrics, not just team structure and team processes clearly and with many examples and scenarios to help understand how these issues manifest and how the proposed steps work to resolve the issues. Organizational transformations to Agile often fail, not because the individual processes and practices break down, but because the organization itself, its power structure, its organizational norms, and its culture fight against the gains that Agile has the potential to bring. Sriram focuses our attention on the systemic problems, but then provides action steps to allow us to address these problems in our context. This book presents no silver bullet, as those don’t exist. However, Sriram provides for organizations a way to start facing reality and moving towards an organization that supports not only Agile software development but organizational and business agility. A number of years ago, Silicon Valley marketing guru Geoffrey Moore quipped, “A bank is just a computer with a marketing department.” Today, technologies—cloud, social, big data, the Internet of Things, mobile—continue to drive this unprecedented digital transformation in organizations. As such, the need for agility has moved from software development to corporate boardrooms. Sriram’s book makes the case that to thrive in these fast and uncertain times, enterprise leaders need to rethink how IT, not just software development, is organized, structured, and measured. His book provides guidelines, not prescriptions, which enable innovation, adaptability, and responsiveness at scale. Sriram has pulled off an audacious attempt at a unified theory of IT. Led me through the incredible range of issues that I recognize, slotting each one into context and building a vision of how things can and should be. If you want to be elevated above the trenches of Agile & DevOps to get a better view of where they fit in the digital world that includes sales, finance, governance, resourcing, delivery & most importantly people then read this book. A compelling read that I’m already referring back to. Organizational structure is a key enabler for a company to achieve its raison d'ê·tre. This books lays out the rationale for organizing IT organizations around the Agile software development concepts. It provides practical guidance on wide-ranging success factors including tangible org elements such as structure, team design and accountability, and intangible cultural elements such as alignments and norms. These concepts will certainly help IT companies turn the tide on huge cost and time overruns that are typical on large IT projects. —Paul Kagoo, Engagement Manager at McKinsey & Co. The field of Agile is an evolving moving target and there is little in terms of guidance for managers and staff that are trying to implement it within an enterprise context. This book provides a complete guide to all of the organizational aspects of implementing agile within the enterprise context as well as providing extremely useful examples and cogent advice. I would recommend this book to anyone with a general interest in agile through to senior managers looking to re-energize their enterprise organizations using the principles and practices of agile. Agile and Continuous Delivery transformations require changes in Technology, Process, and People. This book is the first to tackle the People aspect in-depth, and does it very well. A must read for those taking the journey! Adopting agile software development practices is not just an IT change it is a organization wide change. Sriram goes through every aspect of what this means to an organization and gives options for how to bring changes in, include hard-to-change areas like project funding. This book is thought provoking, an easy read and includes great examples. I found it to be well organized with an in-depth knowledge of challenges that IT organizations face and providing possible ways to address those challenges. Moreover, it was eminently readable and I found myself readily recognizing the problems described within. It may seem odd to describe a business-oriented book as such, but I found this to be an enjoyable read! Sriram makes a convincing case that digital transformation efforts need IT agility. 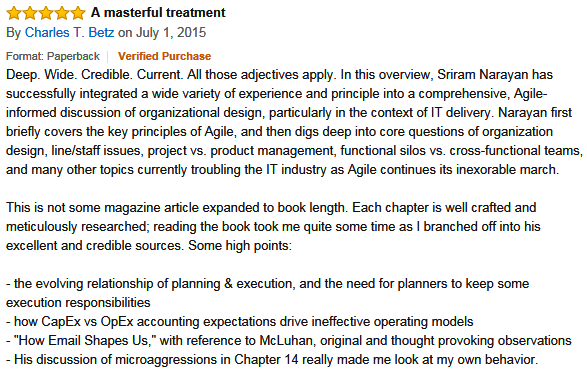 He also does a great job of explaining how IT agility is more than just engineering and process. This book is a valuable read for those on the Digital transformation journey. 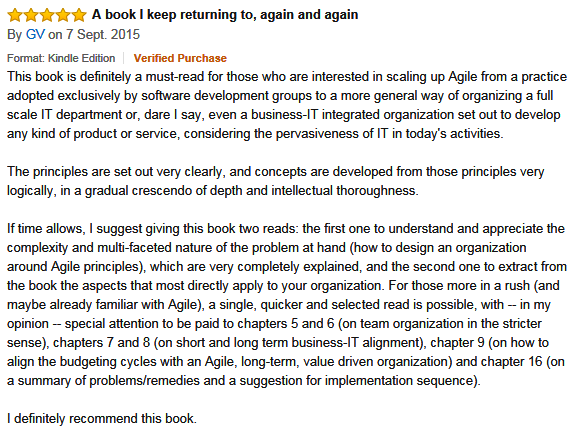 —Shashank Saxena, Director, Digital and eCommerce Technology, The Kroger Co.
Agile IT Organization Design is an engaging, enlightening and an immensely practical book. While many authors have addressed Agile software development, very few have tackled the wider topic of the more systemic changes necessary to move from Agile software to an Agile organization, and onwards to “digital transformation”. Even fewer have done so at more than a very theoretical level. Drawing heavily upon his substantial practical experience. Sriram explores the pitfalls of many of our current “organizational wisdoms” and gently but convincingly suggests appropriate and relevant alternatives to try in their place: all the time backed up by real world examples. I highly recommend the book to anyone interested in, or struggling with, the challenges and opportunities of achieving organizational agility.